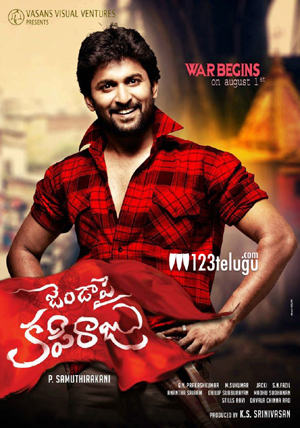 Nani’s upcoming film Jenda Pai Kapiraju is fast nearing completion. Recently, the film unit was in Coimbatore to shoot some crucial scenes and after that, the team has shifted to Hyderabad. Nani, Amala Paul are playing lead roles in this action drama. Samuthirakani is directing it and K S Srinivasan is producing this bilingual film under Vasan Visual Ventures banner. Currently, Nani is taking part in the shoot and this schedule is expected to continue in Hyderabad for some more days. The film’s Tamil version has Jayam Ravi and Amala Paul in lead roles and it’s expected to hit the screens soon. GV Prakash has scored the music. The film is said to be inspired from true incidents and it’s based on the theme that if you change yourself, the society will change automatically. We had earlier reported that Nani is sporting two completely different looks in this film and if this film succeeds commercially at box-office, it’ll work wonders for Nani’s career.